Having well-aligned teeth is a sign of overall health as well as a source of confidence -- and orthodontics are the best way to correct dental alignment problems to get the smile you want. Dr. Henderson provides several ways for patients to enjoy more confident and beautiful smiles with braces in Carthage. Our dentist, Dr. David Henderson, has provided comprehensive treatment with braces for over 20 years. In addition to his years of experience, Dr. Henderson has also completed several continuing education courses on orthodontics from the American Orthodontic Society, making him knowledgeable and capable to provide this level of care for patients in his community. Full Metal Braces – While many new treatments are available in braces technology, traditional metal braces are still the most predicable and effective way to treat all ranges of alignment issues, from crowded teeth to complex bite alignment problems. While metal braces may not be older patients’ first choices for care, many children and adolescents prefer metal braces, as they are customizable with colorful rubber bands. Self-Ligating Braces – This twist on standard braces treatment incorporates special brackets that do not require rubber bands to retain wires. With options for white colored brackets and wires, self-ligating braces can be a more discreet option for patients with comprehensive alignment issues who are concerned about highly-visible dental appliances. Invisible Aligners - One of the most popular treatment choices available, completely clear, removable braces offer an invisible way to straighten teeth. Dr. Henderson provides Invisalign® in Carthage, which is a trusted brand in clear braces that is specifically designed to be as minimally noticeable as possible. 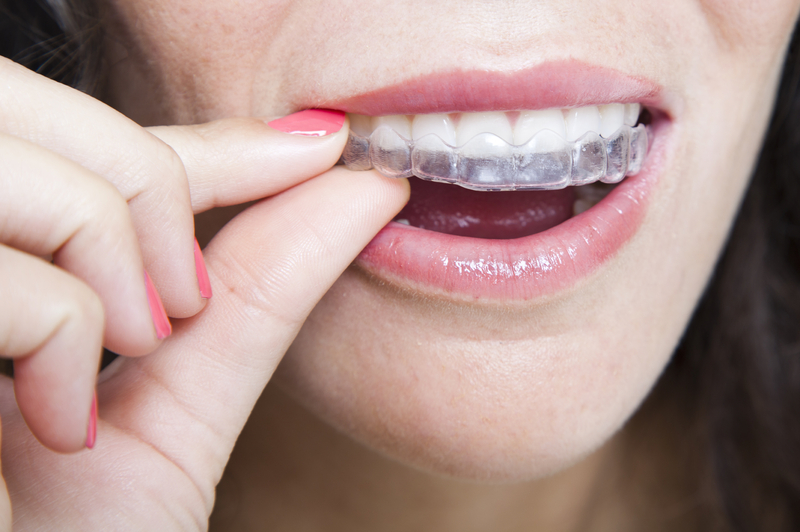 Invisalign® works well for adults who can be committed to wearing their removable aligners each day and night and are concerned about their appearances during treatment. Invisalign® can help correct common mild to moderate dental problems with barely-there, metal-free dental trays that are custom molded for a comfortable fit. Dr. Henderson makes it easy for patients to receive the comprehensive care they need, without traveling out of their way to see a specialist. Our years of experience and dedication to continuing education allow Dr. Henderson and his team to provide effective orthodontic treatment for children, teens, and adults in Carthage. If you’re ready for a more beautiful smile with straight teeth, contact our dental office today. Dr. Henderson’s orthodontic solutions can be made to fit your health needs, lifestyle, and preferences. Contact our office today for your braces consultation at our Carthage dental office.